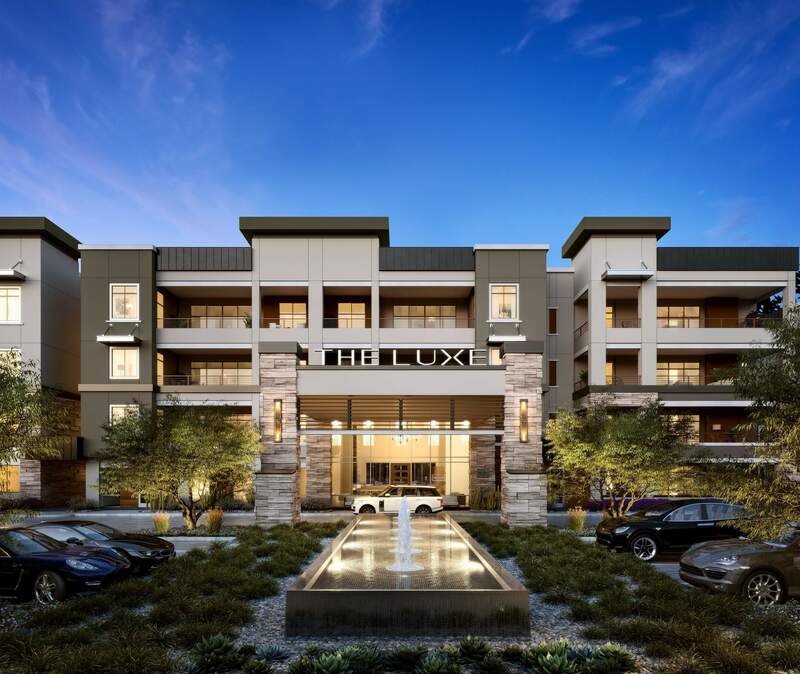 Phoenix, Ariz. – The Statesman Group announced today that sales will launch for the first release of 30 homes at The Luxe, a $125 million luxury condominium community in Desert Ridge, when the on-site Sales Gallery opens to the public on July 6. Already 50 percent pre-sold, The Luxe has been met with high demand since Statesman first announced the 10-acre development located on the west side of Deer Valley Road between 52nd and 56th streets. Priced from $500,000, The Luxe is a collection of 223 single-story two- and three-bedroom condominiums that sit within six, four-story buildings ranging in size from 1,630 to 2,300 square feet. Construction begins on the first 30 homes in early 2019. Within the first phase, each residence will feature modern, open living spaces with great rooms; expansive kitchens with built-in ovens, drop-in stovetops and oversized islands; large walk-in closets; and two enclosed underground parking units with storage and an optional garage gate for privacy. Homes at The Luxe will bring the outdoors in with massive cascading doors that open out to some of the Valley’s largest condominium patios complete with an optional grill and unobstructed views of the J.W. Marriot Desert Ridge golf course and Pinnacle Peak mountains. Residents will also have access to resort- style amenities designed for seamless indoor and outdoor living including an 12,767 square-foot clubhouse with an exposition kitchen and wine room, multi-seat movie theater, game area, indoor mailroom, working lounge and conference room; and a 4,000 square-foot fitness center with Peloton Bikes, a yoga room and his and her steam rooms with showers. The amenities continue outdoors with two heated pools, one nearly Olympic-sized length; an outdoor kitchen with barbecues; a picturesque Beer Garden- inspired space with strung bulb lighting and long communal tables, grass and picnic tables; and lush, verdant landscaping throughout the property. The Sales Gallery will open to the public on July 6 and feature a state-of-the-art interactive experience where prospective buyers can experience the floorplans and see specific views from each residence. To schedule an appointment for The Luxe, prospective buyers can visit the Sales Gallery (5250 E. Deer Valley Road), call 480-767-5665 or visit the website at http://www.theluxecondoliving.com.